A forecast of very strong gusting winds has forced the cancellation of the second day of a huge open water swimming event. 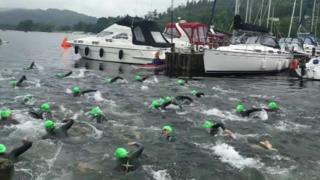 Thousands of swimmers head to the Lake District each year for the Great North Swim on Windermere. Organisers have scrapped Sunday's swims but said Saturday's would go ahead. "We understand this will be disappointing to those planning on swimming on Sunday but your safety is our number one priority," they said. Sunday swimmers would be offered the option to take part on Saturday, they added. Swimmers can choose distances ranging between 1 mile (1.6km) and a 10k stretch.